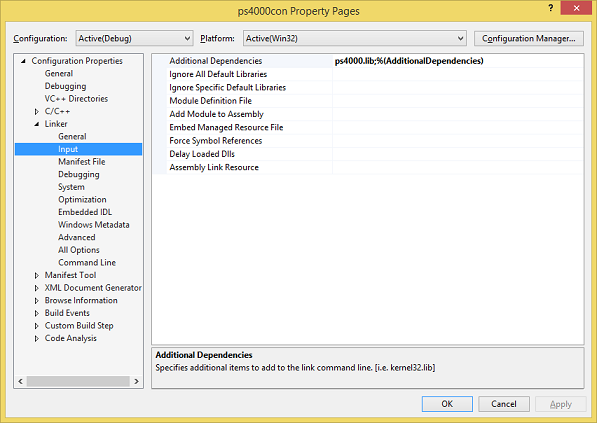 I've been trying to build the example program ( ps4000con.vxcproj ) in Visual Studio. However, I have the following build errors which I can't understand why I am receiving. I see that ps4000Api.h and picoStatus.h are already listed as External Dependencies, and I have also added ps4000.lib to the project as a 'Solution Item'. I have also added the ps4000.dll in the Debug directory, but presumably this is only required at run-time. Are you building for any Cpu? If so try forcing to 32bit or 64bit. I hope to build both a 32-bit version and a 64-bit version. I've got Visual Studio running on a 64-bit machine. Force it with compiler directives? I have just loaded up the solution from a clean install of the current SDK on our website, and using Visual Studio 2015 have built both 32bit and 64bit versions just by changing the build tools to the latest version for VS2015, which can be found in Project->Properties->Platform Toolset. No need to add any files or dependencies to the solution.